iPod touch 4G was announced only a few days back at Apple’s annual “Special Media Event” in San Francisco. Even though the new “touch” has got two cameras: one on the back for HD video recording and one on the front for FaceTime calls, 960 x 640 Retina Display and all, but the fact that the camera on the back can only take still shots at 0.7 megapixels was met with disappointment by many. And now, 9 to 5 Mac has discovered that the Retina Display on the new iPod touch also may not be of the same quality as the one found on iPhone 4. 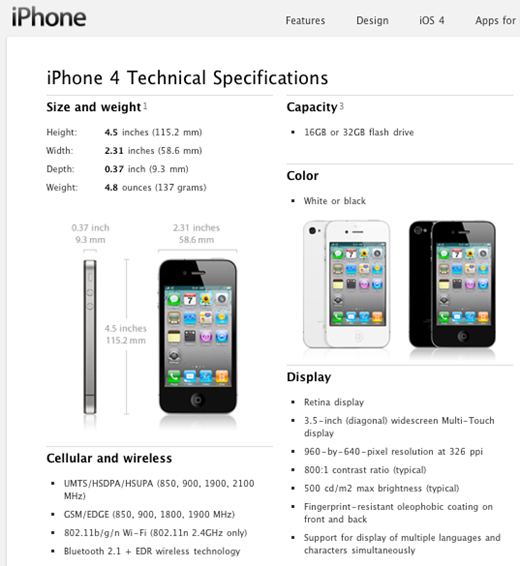 If you check out the technical specs of the iPhone 4 and iPod touch 4G on Apple.com, you will notice that “Retina Display” and “Contrast Ratio” (IPS) bits as used in the iPhone 4’s Retina Display which enables the user to view the screen from tight viewing angles is missing from iPod touch 4G. You can also see this difference in the video embedded below. Skip all the way to 00:15 and you’ll notice that the screen of iPod touch 4G looks washed out compared to the one on iPhone 4. 🙁 I might still buy this, cut my cellphone bill and use my college’s wifi for Google Voice. Lots of money will be saved! ..
whats the camera that engadged films with in the video? What camera are used to film the iTouch in the video from Engadged? Ok, it looks a bit washed out, but this might also be because on the touch is a very bright picture and on the iPhone 4 there is a darker. U notice video app, green overall and white on videocam on first page on iPod Touch 4gen. I know this is off topic but could it be possible to have folder support for ios 3.1.3, like in ios4.0…. im experimenting of copying the springboard app in ios 4.0 to ios 3.1.3 but it did not work… Any ideas? I am not saying this from a technical stand point as your post has already mentioned that the specs information is missing. Also the video can be tricky but I am talking about it from feasibility point of view. It would be lot cheaper for Apple to produce one kind of display panel, in this case iphone 4’s and use for both devices whereas producing two panels which are different in some specs are just not feasible. Now this is just a guess as I have experienced in real life manufacturing process but who knows if the Apple’s display supplier (most probably Chinese) has offered them a discount for stripping down some technical specs so that Apple can sell the iPods cheaper. 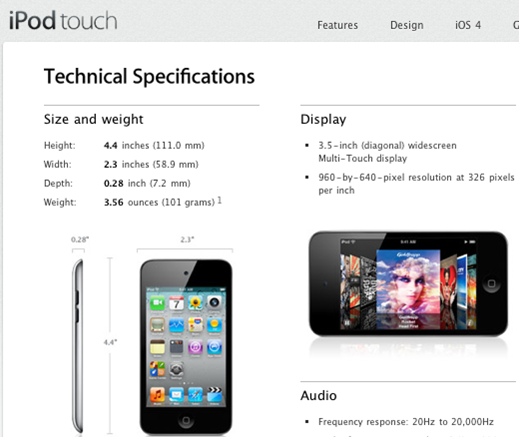 Maybe somebody just forgot to put it in the specs – maybe they thought iTouch users wouldn’t care.